Current Talk from Brian May on Possible Queenbert Shows! You are here: Home / More Featured Posts / Current Talk from Brian May on Possible Queenbert Shows! This is big news Glamberts! Brian May gave a post-iHeart interview to Washington radio’s BIG 100.3 and talked so highly again of his and Queen’s relationship with Adam Lambert. Best of all is that talks are in progress for future appearances for the band with Adam as their singer! Listen in. At 3:30 come the words we’re waiting for! Great news! I really hope Atlanta is on the list of possible venues! I’ve never seen Queen in person. I so agree with you. Shelby. Atlanta was the first place I saw Adam (GNT), and it would be wonderful to see him there again with QUEEN !!! 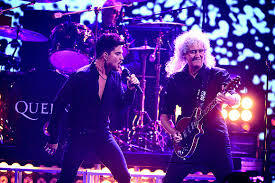 What a dream come true, if Adam could tour with Queen! I saw their concerts last summer in Kiev and London, only on you tube, and was mesmerized . They were such a perfect match, like they were performing together for years. Not just the music, but the chemistry was electrifying! Maybe, if they do tour, Adam will finally get the recognition he so deserves ! And Queen gets another chance to entertain millions. What a gift to the music world !! !